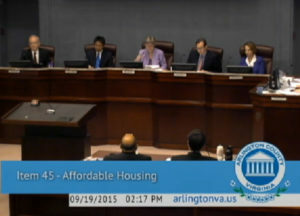 (Updated at 3:20 p.m.) Following nearly five hours of discussion and heartfelt testimony, the Arlington County Board on Saturday approved an ambitious plan to replace rapidly disappearing market rate affordable housing in the county with more subsidized, committed affordable units. Affordable housing supporters showed up in force to the meeting, well outnumbering critics who questioned the use of taxpayer funds to house residents who could otherwise not afford to live in a desirable, increasingly affluent inner suburb like Arlington. Young parents, immigrants, teachers, seniors, businesspeople and clergy members, among others, spoke passionately in support of the plan, which calls for the creation of 15,800 new committed affordable housing units over the next 25 years. The Affordable Housing Master Plan approved by the Board was the culmination of three years of study and community engagement. Board members and community members spoke of the “marathon” process that led to the plan’s passage. Some spoke of continuing “the grand legacy” of former County Board members and local legislators who were instrumental in the county’s early support of affordable housing. The plan provides a framework and goals for affordable housing in Arlington, but stops short of funding or planning individual housing developments. Under the plan, the County will try to dramatically increase the supply of housing that’s affordable primarily to those making less than 60 percent of the area median income. County Board Chair Mary Hynes said that affordable housing is integral to keeping Arlington an inclusive and diverse community. 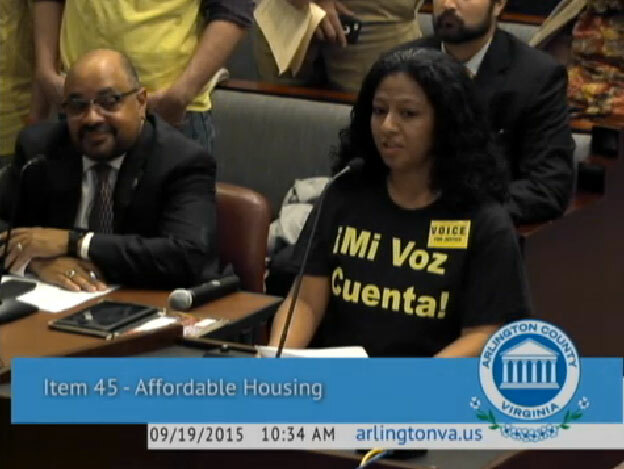 Among the personal affordable housing stories the Board heard was one from Claudia Delgadillo, an APS teacher and parent and a representative of the newly-formed group Mi Voz Cuenta — “My Voice Counts.” Delgadillo was once a recipient of free and reduced launch at school, but said she worked to put herself through Northern Virginia Community College and George Mason University. Delgadillo said the hard-working immigrant community along Columbia Pike — those who are relying on Arlington Public Schools to educate their children so they can achieve a better life — deserved to have their voices heard, since they were among the most vulnerable to getting priced out of Arlington. Also speaking in support of the plan was Katherine Novello, a founding member of the group Coalition of Arlingtonians for Responsible Development. Mi Voz Cuenta was formed partially in response to CARD, which pushed back against what it saw as an increasing concentration of affordable housing in South Arlington. Novello said the group was satisfied with changes to the plan intended to better distribute affordable housing throughout the County. Novello said that her husband grew up in affordable housing with his three brothers, while his mom, a single mother, went back to college. Ultimately, she became a teacher and then a school counselor, and the family was able to move out of affordable housing, she said. Some County Board members had to choke back emotion before casting their vote. The affordable housing plan, however, was not without its critics. Independent County Board candidate Audrey Clement was skeptical of the affordable housing plan, suggesting that it will continue to push out middle class Arlington residents while real estate development continues unabated. Other critics spoke of affordable housing potentially adding to the current school capacity crunch at Arlington Public Schools. Some critics have pointed out that a formerly oft-repeated line about affordable housing — that it allows public servants, firefighters, cops and teachers to remain in the county — isn’t borne out by actual statistics of who lives in affordable housing in Arlington. In reality, affordable housing residents are far more likely to be restaurant and retail workers, construction workers and taxi drivers. While the business community has spoken out in favor of workforce housing to keep such workers closer to their jobs, it perhaps doesn’t have the emotional weight for local residents of saying that their children’s teachers are potential affordable housing residents. Still, at least one APS teacher said the plan will be good for educators, who may be able to afford Arlington now but may not in the future. County Board member Libby Garvey acknowledged that, if implemented, the affordable housing plan will have its costs. (Currently, Arlington devotes about 5 percent of its overall budget to housing, and currently there are about 7,000 committed affordable units in the county.) However, she said the process and the plan will ultimately be worth the price. CARD would like to congratulate the County Board and County Staff on the passage of the Affordable Housing Master Plan (AHMP). We are thankful for the work that has been done over recent months to fine-tune and improve the AHMP and Implementation Framework so that they better reflect the vision of Arlington as a diverse and inclusive community. We are especially heartened to see that a core focus of the plan has shifted, at CARD’s urging, to affirm a commitment to affordable housing development opportunities throughout all of Arlington’s neighborhoods. A mandate that no net new committed affordable units (CAFs) be developed in areas of concentrated poverty to prevent greater economic segregation. We still believe that the plan could have gone further to encourage housing affordability throughout Arlington, especially concerning the building of on-site affordable units in new development projects. CARD proposed creating a committee to study and provide recommendations regarding possible changes to the Affordable Dwelling Units Ordinance. This legal authority, which largely governs Arlington’s affordable housing efforts, substantially limits the county’s ability to encourage developers to build affordable housing units on-site. This is a policy proposal that can be embraced by all advocates for affordable housing. We look forward to continuing to work with the County Board, County Staff, and community stakeholders to advocate for more affordable housing throughout all of Arlington.